When Matthew (Mathew) Phipps (Phips) of Clay and Owen Counties, Indiana “died” in 1841, this resulted in a vast amount of legal wrangling over his estate. I placed “died” in quotes because the story that has been passed along is that he loaded a flatboat with goods (produce, in one version of the story) and went from Freedom, in Owen County, Indiana, to New Orleans to sell this merchandise. This part of the story would make sense. Although his store was at Bowling Green in Clay County, Indiana, he lived in adjacent Owen County near Freedom. This is evident from the sale bill of his estate sale, in which his store goods were sold at Bowling Green and his household items at his Owen County home until everything was sold. Matthew was presumed dead, and his widow, who had been Mathursa Toliver, then remarried. 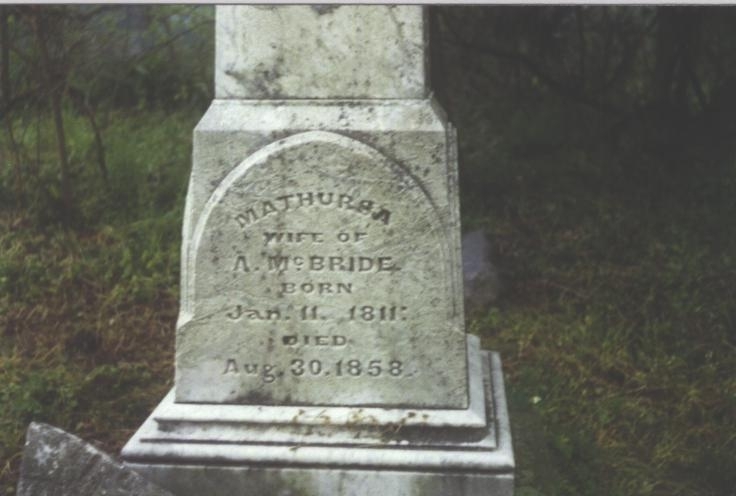 This time she married Alexander McBride. She is buried with her second husband in Hicks Cemetery at Freedom. Matthew’s family had been largely associated with the village of Freedom in Owen County, located on the White River. Taking a boat from a little land-locked farming community buried deep within Indiana all the way down to New Orleans may sound like a stretch, but it was actually the 19th century norm. Murdock then goes on to explain that this type of adventure was common – and profitable – in the 19th century. That was the case unless one fell victim to robbers. In the case of Matthew Phipps, the vague and ambiguous story was that once he reached New Orleans he was murdered for his money. Possible, certainly, but according to a story told to me by a descendant, Lucille Chalfant, before she died, Matthew made the trip with another local man. That man returned, but when asked what happened to Matthew, he was evasive and would not tell much of anything. That’s one part of the story that seems a bit hard to swallow. That’s especially the case considering the huge amount of litigation and probate administration, both locally and in the state capital, that pertained to this estate after Matthew was declared deceased. Why would this man not have been questioned extensively about what he knew of Matthew’s demise? Of course, on the other hand, it’s possible that he actually was questioned. Owen County, Indiana holds voluminous records, seemingly tons of them, which have never been microfilmed. Not only that, but the courthouse staff tells me that they are too understaffed to answer mail inquiries. I stopped in once, back in 1992, on the way from Ft. Wayne to St. Louis. I intended to stay an hour or two and ended up staying a couple days. Two subscribers of my genealogical quarterly happened to be there from another state, researching their own Phipps and related families. Back then, Roger Peterson was still alive and was acting as Owen County Archivist. He helped guide me through the vast holdings of the basement of the Owen County courthouse. That was one county that seemed to have kept records on everything, and to have kept everything. Time spent was insufficient to go through anywhere near everything. In fact, probate packets were just beginning to be catalogued by Peterson and were saved for another day. Surely, I thought, I would be back soon. That was about exactly 20 years ago. Perhaps somewhere in all that “stuff” is more information about what happened to Matthew. Murdock, the Purdue professor, says he became interested in flatboats after hearing stories told by a local man, Clarence Dyar. His paternal grandmother came in 1818 from North Carolina to Owen County, a scenario that seems reminiscent of the Phipps’s journey from the same state to Owen County, but a few years later, in 1833 or 1834. Actually, that’s referring to my direct line. Other Phippses appear to have been in the area earlier. A certain George Phipps had a store in Eel River Township in adjacent Greene County apparently as early as 1824, according to an 1884 history of the county. Dyar, according to Murdock, told of taking flatboats from Freedom, Indiana to New Orleans every spring. Freedom, again, was Phipps territory in the 19th century. My great-grandfather John Andrew Phipps, son of Matthew Phipps, was born at Freedom. If I remember correctly, this town name is even emblazoned on his tombstone in Missouri as having been his place of birth. And John A. Phipps married a Dyar, or Dyer. Not long before he died, he filled out a pension form by writing across it, “Married 4 times – wives all dead.” One of those four wives (his second) was Mary A. Dyar. According to Clarence Dyar’s stories, once they reached New Orleans, they would sell the boat and then walk back to Indiana. Sounds like a long walk – actually about 800 to a thousand miles. Taking a steamboat most of the way back, however, would have cut into the much-needed profits of the venture. A web page posted by a church in Freedom, Indiana contains a bit of historical info on the village. The page points out that Freedom is situated on the West Fork of White River, the same fork where Murdock wanted to start out from, but in Greene County rather than Owen County. In 1884, according to this page, Freedom became an important shipping point for flatboats. Other historical sources refer to Freedom as having been a major flatboat putting-in point. And evidently the stories that Dyar told were not uncommon. When I visited Freedom in 1992, it was a tiny village with a small general store, complete with a bench out front that seemed designed for old-timers. One of those old-timers told me that he remembered Cary Phipps, who used to live in the area. In the early 19th century, however, Freedom was a jumping place. James R. Dickenson, in his widely available book Home on the Range: A Century on the High Plains, speaks of family stories about Freedom as he details the lives of members of the family of Toliver Lovall Rusaw Phipps. Toliver L.R. Phipps was a son of the Matthew of the flatboat incident. Even though the book chronicles the Phipps family’s times in Kansas, Dickenson writes of family recollections of wild times in Freedom, Indiana as the locals would get drunk and enter into no-holds-barred fights. Those fights sometimes ended with one or both parties having one less eye as a result, since eye-gouging was evidently a popular barroom activity. In the 1820s, according to this story, some Gulf pirates came into Franklin Township in Owen County. They buried a cache of gold coins on a bluff east of Freedom. In order to mark the spot, they drove a sword into a tree. The story of the burial of the gold coins was passed on later, but no one could find a tree containing a sword. In 1875, however, John Phipps (who is not identified in the story) found a rotten log with a sword in it. John measured the log and figured that when it was standing, the sword would have been about 25 feet up off of the ground. (No wonder no one ever found it.) The sword was then placed on display in the Geological Room of the State House in Indianapolis, but the coins were never found. Who this John was, if the story is indeed true, is unclear. John Meshack Phipps, son of Jesse Phipps/Jennie Spurlin and twin brother of Eli Shadrack Phipps, would have moved out of the state by then. One possibility is that it could have been my great-grandfather John Andrew Phipps, since he was evidently living in Owen County until 1877. An affidavit in his Civil War pension file reveals that he left Indiana and “went west” in 1877, according to testimony by Anna E. Conder, a relative of the woman who later became his third wife. Probably a better possibility, however, was that this John could have been the John Presley Phipps who was a son of Thomas Jefferson Phipps. Thomas Jefferson Phipps was a son of Matthew of the ill-fated flatboat voyage, and Thomas lived at Freedom. This John would have been about 22 years old at the time of the 1875 discovery of the sword. 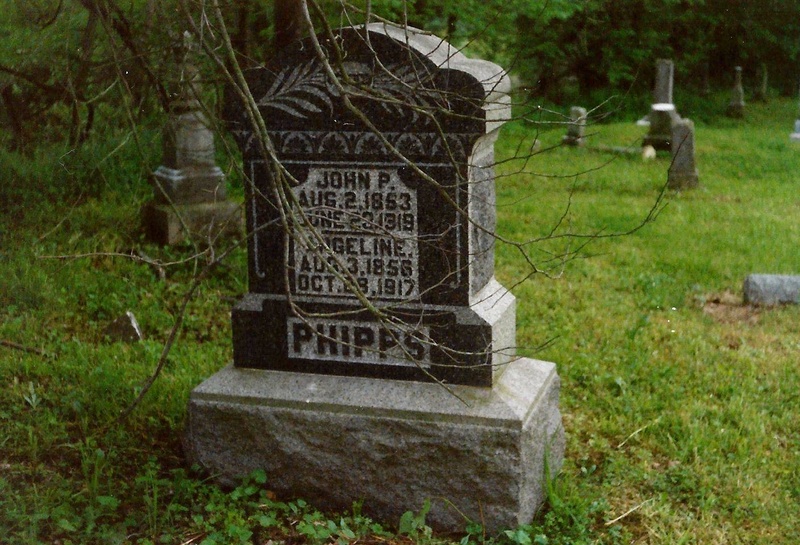 John Presley Phipps is buried at Freedom in Hicks Cemetery. His tombstone, as I photographed it in 1992, appears below. Does the pirate story suggest that pirates were traversing up and down the route between New Orleans or Natchez, on one hand and, further north, the tiny town of Freedom, via these rivers? Could my great-great-grandfather Matthew Phipps have fallen victim to pirates? Or could he even have just simply left and taken an assumed name in order to escape his (apparent) financial mess back in Indiana? “The judiciary committee to which was referred the communication of Samuel Miles, administrator of the estate of M. Phipps, deceased, praying that a law may be passed ‘to sell property on all demands in favor of said estate, without valuation,’ have had that matter under consideration and have directed me to report that they would regard the passage of a law such as prayed for by said administrator, inexpedient and unjust; they therefore ask to be discharged from the further consideration of that subject. In 1994 my mother and I went to Spencer researching our ancestor, Lewis Boling (d 1872) and his family, who were also buried at Hicks Cemetery. We too met with the delightful Roger Peterson who was extremely helpful. I was so impressed with him trying to save the historical documents contained in the Owen County Courthouse – a monumental task. I enjoyed reading your piece on Matthew Phipps and will look for some of the web sites you found. Lewis Boling was in the Black Hawk War of 1832. Were any of your family caught up in that too? March 3l, l975, I published in my Owen County history column in the Spencer Evening World article titled “the Sword & Buried Treasure,” re John C. Phipps’ finding the sword…I was betting it was a souvenir from the ll947 War with Mexico–Owen County had veterans. That’s l847 Mexican War, sorry. I am related to Mathew Phipps through his son Thomas Jefferson Phipps. Whatever happened to him is an interesting story either way. From two 1875 Indianapolis newspaper articles I believe John Phipps was working on his father-in-law’s land, Mr. Dyer, when he found the sword and ground it down to harvest corn, not understanding his discovery. It would have been lost to history but the Indiana State Geologist assistant John Collett was preparing an 1875 survey of the White river in Owen County Indiana and must have met Mr. Phipps, who gave him the sword. The Dyer’s still own and operate a farm at this location in Freedom, but I did not attempt to contact them. By now plenty of treasure hunters have been there. I got both of the articles you sent and read through them. I went and looked through our edged weapons collection and did not find anything that matches the description in the articles. Since we don’t have paperwork from the 1870s, I can’t even confirm if it was donated to us or just on display for a period of time. And I’m speculating here, but if it had been part of the collection, given the poor condition described in the article (covered in rust and missing the handle) I could see it having been deaccessioned (the process by which we remove artifacts from the collection) at some point in the last 100 years. Especially if the sword had been separated from its history, which can happen without paperwork. And record keeping was so very different back then there’s not going to be much of a paper trail, if any. But now that it’s on my radar I’ll keep an eye out for any reference to it.